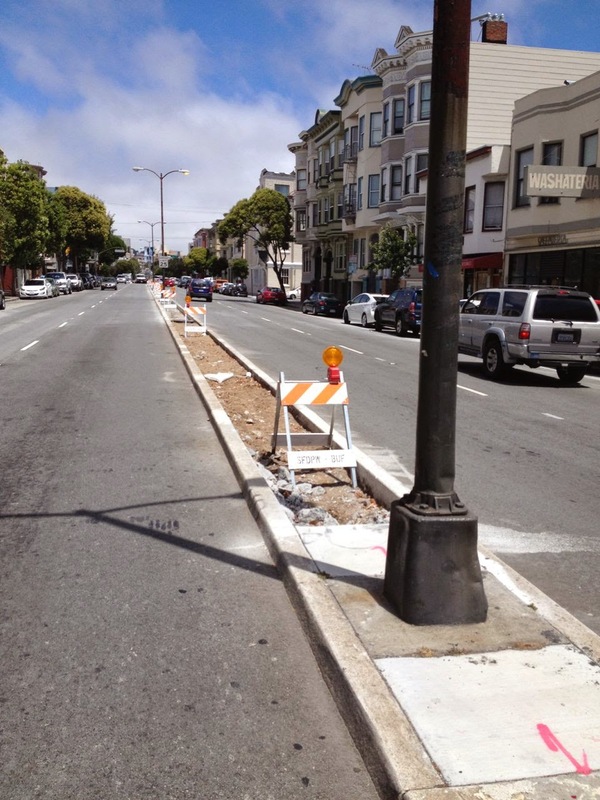 Back in 2005, the earth beneath Guerrero Street's narrow median saw the light of day - on a short stretch somewhere south of Cesar Chavez Street, close to where the street changes names to San Jose Avenue. Thanks to Greening Guerrero, Gillian Gillett and community donations landscaping marched north up until 20th Street, save the block between 22nd and 23rd streets. 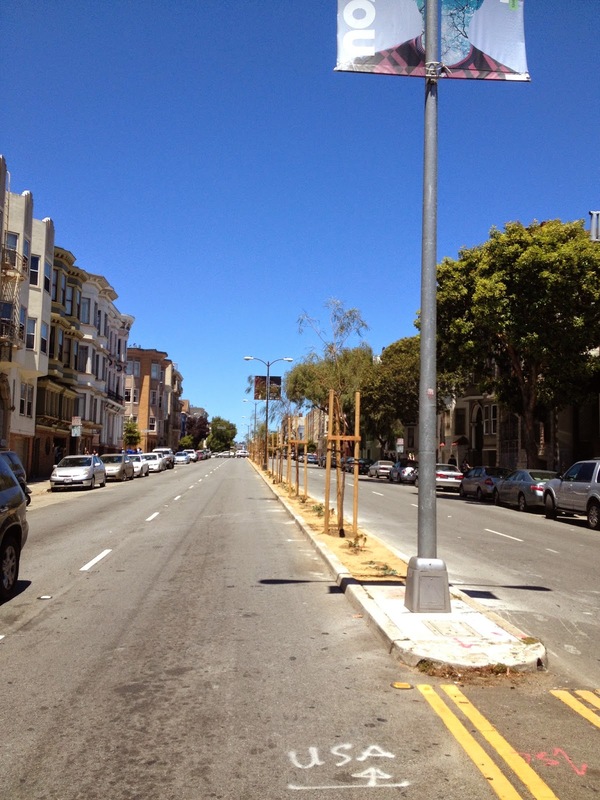 Guerrero Street's speed limit was also reduced from 35 to 25 miles per hour. 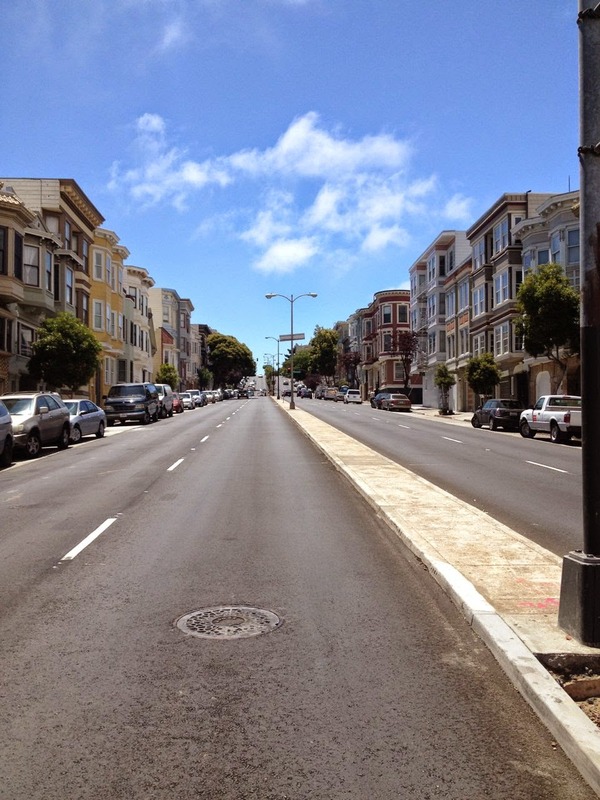 San Jose Avenue also went a 6-lane speedway to a 4-lane street. Regarding the block not landscaped, the holdup was partially due to fact that property owners, not the city, had to agree to pay for the landscaping. Well earlier this year, the block between 22nd and 23rd streets got landscaped through funding made in part by the developer of the former Palm Broker site. 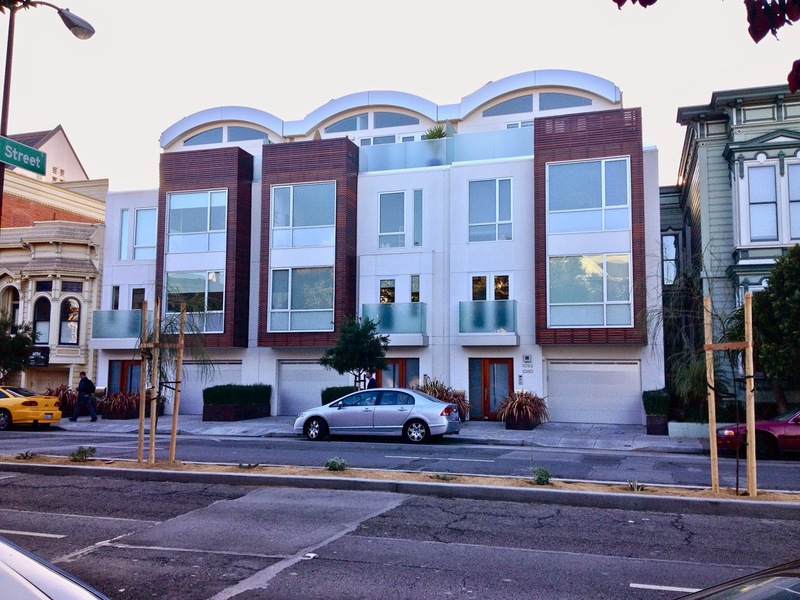 I had assumed that landscaping north of 20th Street was a lost cause because most of these buildings are rentals, and we all know that renters "don't care about the value and well being of their home or neighborhood like homeowners do." However, my assumptions regarding funding the landscaping proved to be wrong. 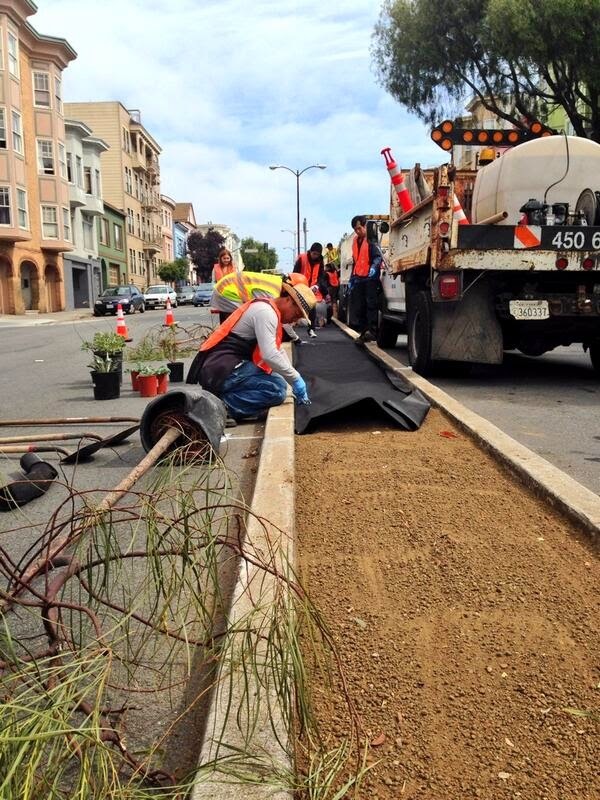 Trees and plants are already in the ground between 17th and 18th streets. Workers have removed the concrete of the narrow median between 15th and 17th street. However the concrete remains north of 15th and between 18th and 20th streets. Although most buildings have changed (no more gas station on the northeast corner), the near left building is the same, and the blue building (blocked by the tree) on the northwest corner is the same. The image below confirms it's got the same features as the 1950s photo. 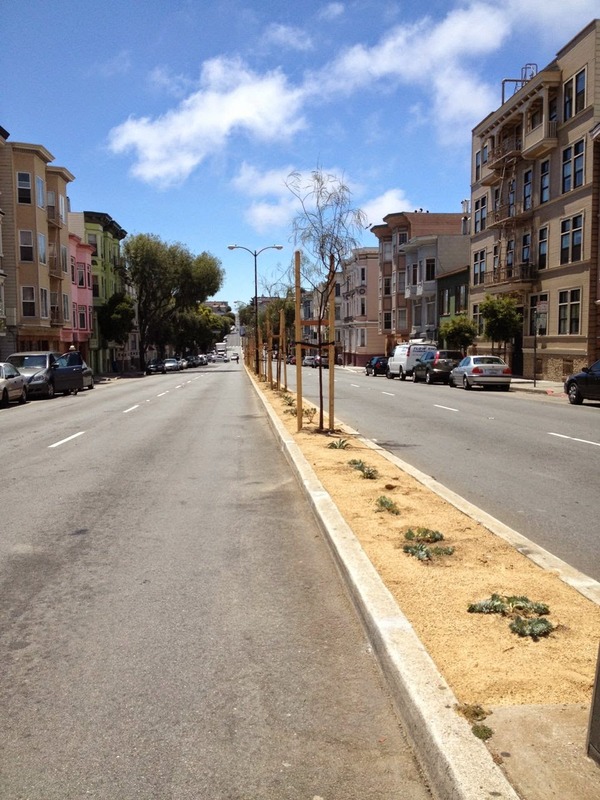 Guerrero Street at 17th Street (looking south) has brand new landscaping. Guerrero Street between 20th and 19th Streets (looking south) still have no landscaping. 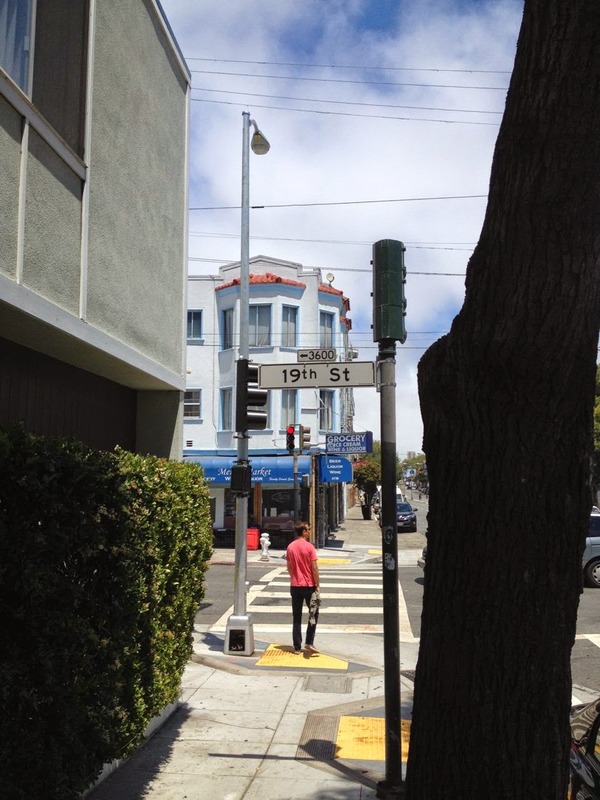 I seem to recall that some sort of The funding came through to finance the median from Market St to 20th St, but I cannot seem to find anything about it other than thanks to Supervisor Scott Wiener's tweets with photos pushing the city to pay for it. Sadly the city hasn't financed the maintenance of the landscaping. Hope those drought resistant Shoestring Acacia trees and other bushes are hardy enough for zero maintenance. I'm sure future weeds will love the lack of maintenance. 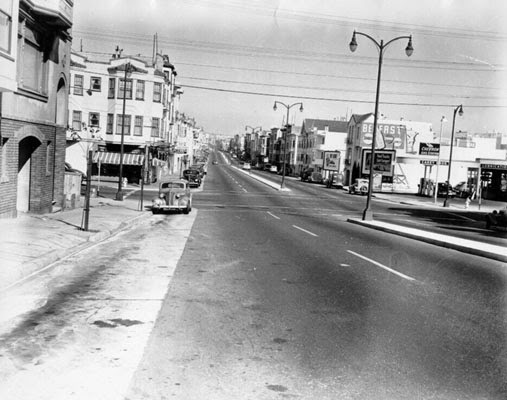 Let's not forget, Guerrero Street once had no median, and instead had wide sidewalks! Not sure what block this shot comes from. 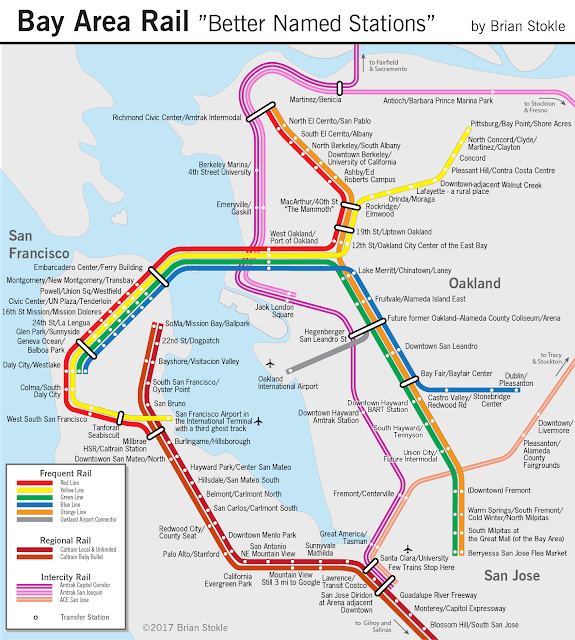 More on some of the history of Guerrero Street can be found in a 2009 article by Burrito Justice. 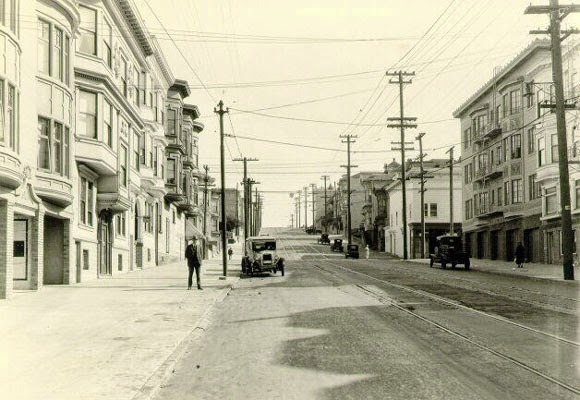 Below is a comparison shot of the same place, which is at the same place as the black and white 1920s image at 20th and Guerrero looking south up the slope of Liberty Hill. I'm pretty sure your unidentified picture is looking south toward 20th Street, with the long-abandoned corner store across the street on the right. You're right. I've taken a look on Google's street view, and it looks like a match. I've added the 2014 street view image in for comparison. 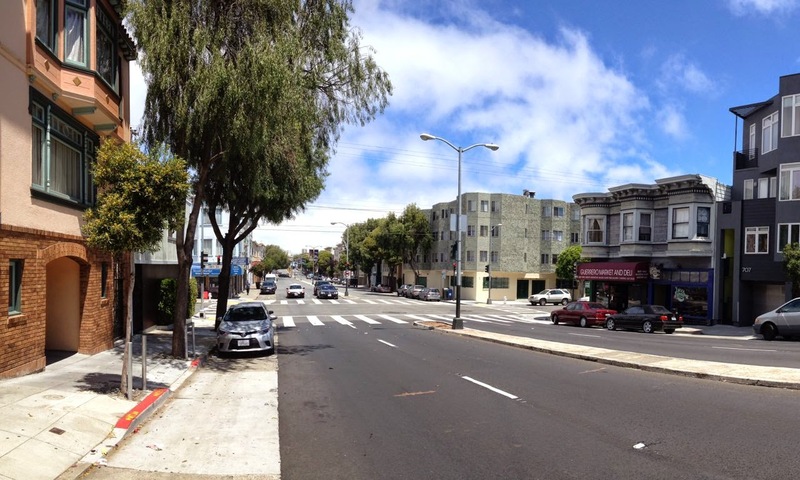 Changes of note: 1920s Guerrero had electrical and telephone lines, two sets of rail, and super wide sidewalks. Also note that there aren't many folks in the early image, although that might be due to photographer's choice. Looks to be a late afternoon shot by the shading angle. 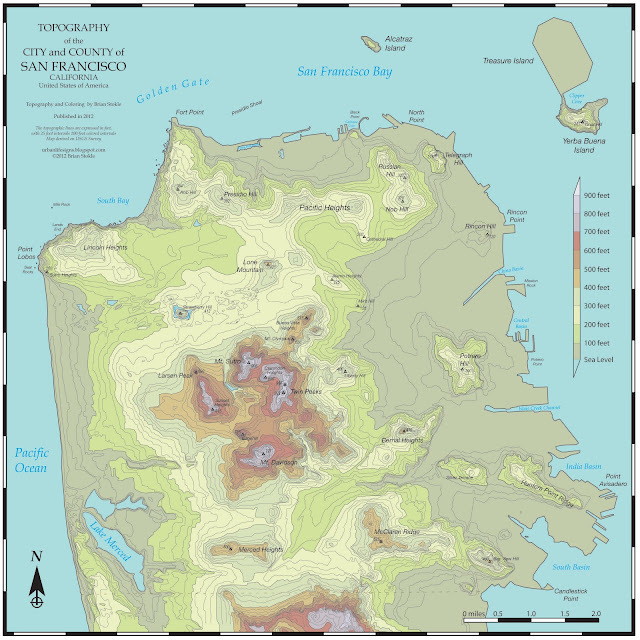 Big notes of 2014 are TREES!, even though not many of them. Super narrow sidewalks, and 21st Century global warming glare ;) Too bad construction was going on in the image to block some of the west side. Most, if not all the buildings look to be the same. 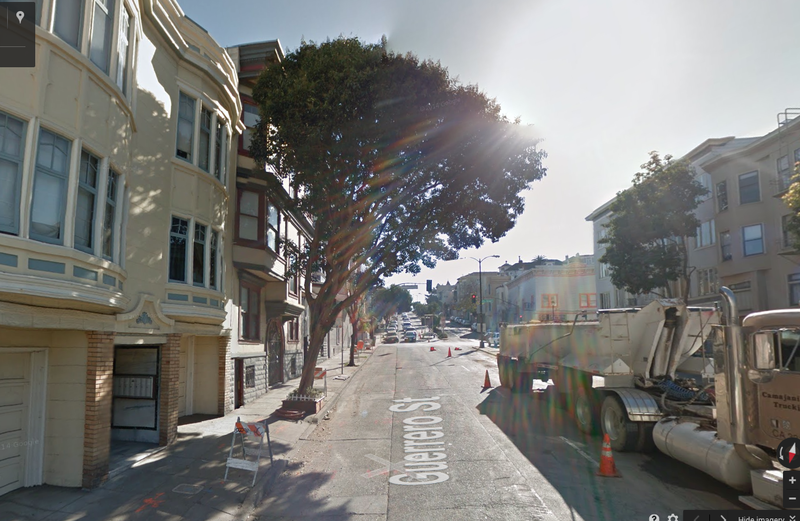 I'm super excited about the trees being now planted between 17th and 18th *but* there's a problem: the folks from Cornerstone Church on 18th street still use Guerrero as their Sunday temporary parking. There are cars still parked on both sides of the newly planted median and people getting in and out of their cars are walking on the new, fragile plants... How is that possible..?! I am ver frustrated that this is happening!